A supercell thunderstrom in Oklahoma. Image courtesy of NSSL/NOAA. A supercell is a highly organized thunderstorm with some components that set it apart from other "garden variety" thunderstorms. Supercells have the capability to produce tornadoes, damaging hail and strong downdrafts (which translate into straight-line winds at the surface). 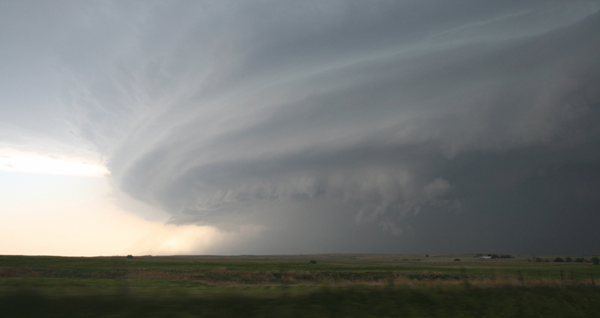 All tornadoes are spawned from a parent supercell, but not all supercells produce tornadoes. 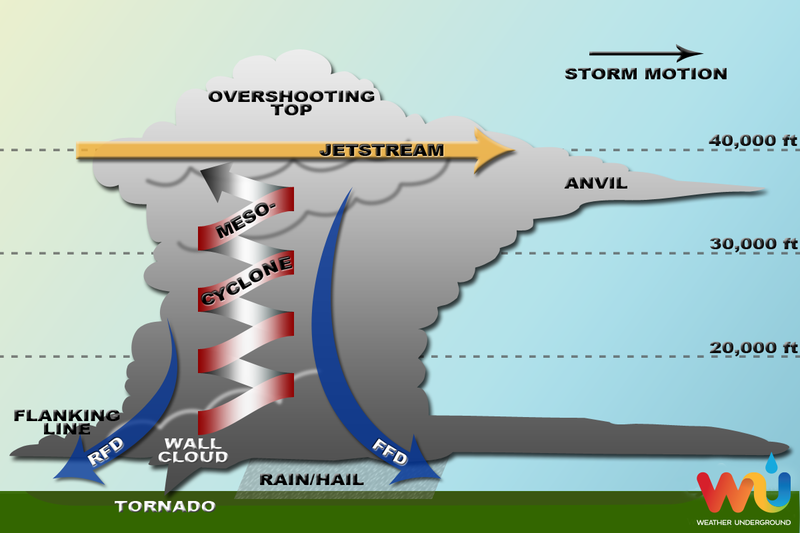 A mesocyclone (or "meso" for short) is formed when a thunderstorm updraft meets veering winds. As the air rises in the thunderstorm, the winds will begin to twist the updraft until the whole column of air is rotating. Although each storm is different, the meso is usually found in the right rear flank of the supercell and is typically 2-6 miles wide. Technically, the mesocyclone is defined as the radar signature that appears if one is present (a yellow circle on Doppler velocity products), but you can often see the rotation with your bare eyes. There are three types of supercells: low precipitation, classic and high precipitation. The definitions of these types are exactly what you would expect, but they have some different consequences.